The ski paintings are all categorised by Ski resort below or you can just view all the ski paintings listed in order. or list Ski Paintings by price order lowest first. 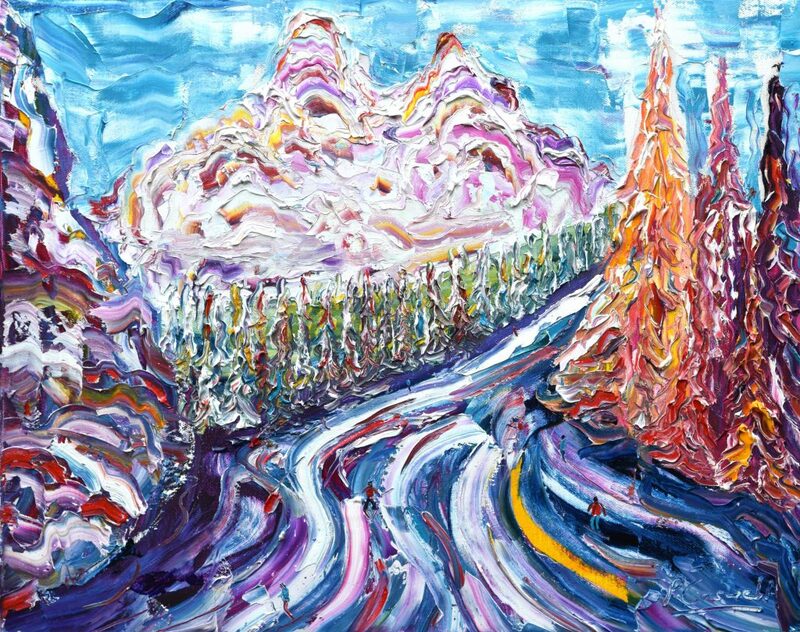 If you only want a print then view all Prints for Sale of the Skiing and Snowboarding Paintings. St Anton Lech Zurs St Christoph. I am a mad keen skier and snowboarder. I have skied since I was 4 and turned to Boarding in my twenties. I now ski or board depending on the conditions. I have skied and snowboarded in all of the best resorts in the Alps and a few more around the globe. I love painting all my favourite ski resorts and the stunning success of my skiing and snowboarding paintings means I have the great pleasure to do this even more. There is something very special about arriving in the Alps with all the snow, the high mountain air, the whirring of the lifts and the intense bright light. The cold, the sun, the energy of these places is just incredible and when you add in these super lifts which whisk you up to the top of the mountain it becomes truly unbelievable. Fresh powder dreams for the ride down just adds the icing on the cake and you really are in Heaven on Earth. If you are low on budget here are the Ski Paintings listed lowest price first or choose a Skiing Snowboard Print or use the Price Slider at the bottom of the product page for each painting for sale. Next on the list is a Ski / Snowboard tour of the States starting at my favourite Whistler and the onto Vail. Not sure where else I will be heading but can’t wait for the extra powder depth that hopefully the heavens will provide. 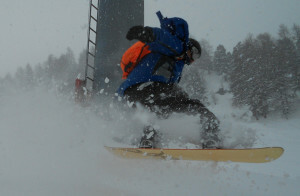 After that it is back to the powder trail and off to Japan via Hawaii for the following season. I would really welcome any tips or help on Japan as this will be my first visit and I don’t want to miss out on anything. For many years I have sketched the Alps to try to solve the puzzle. The air is filled with excitement, the mountains are powerful and lift the spirits beyond limits and danger is all around. The spirit of the area is palpable. The vistas of the Alps are large scale and powerful. Yet the colour scheme in winter is blues, grays and whites which in combination are cold flat and cool. These vistas and views in these cools and low contrast colours dull and mute the scenes which are pictorially correct but do not reflect the high energy of the alpine atmosphere in the skiing paintings. 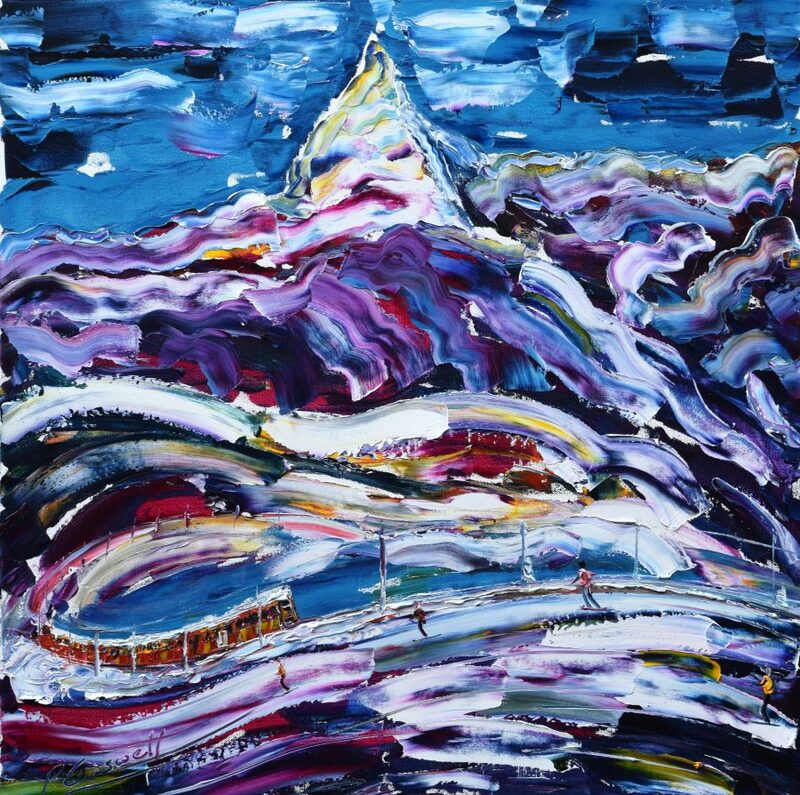 To capture the skiing atmosphere I have drawn many techniques together, to form this extensive collection of ski and snowboard paintings, of partial representation, abstract construction and energy paintings. Choosing high contrast and energetic colours I have drawn the abundant energy and excitement into the scene. By combining partial representation of scenes and abstract construction the paintings draws heavily on your memories of skiing, snowboarding and the Alps to subconsciously represent the energy of the scene and stimulate recollection of the feelings of being, skiing and snowboarding in the Alps. Many of the skiing and snowboarding paintings have been inspired by skiing and snowboarding in my favourite high mountain resorts. 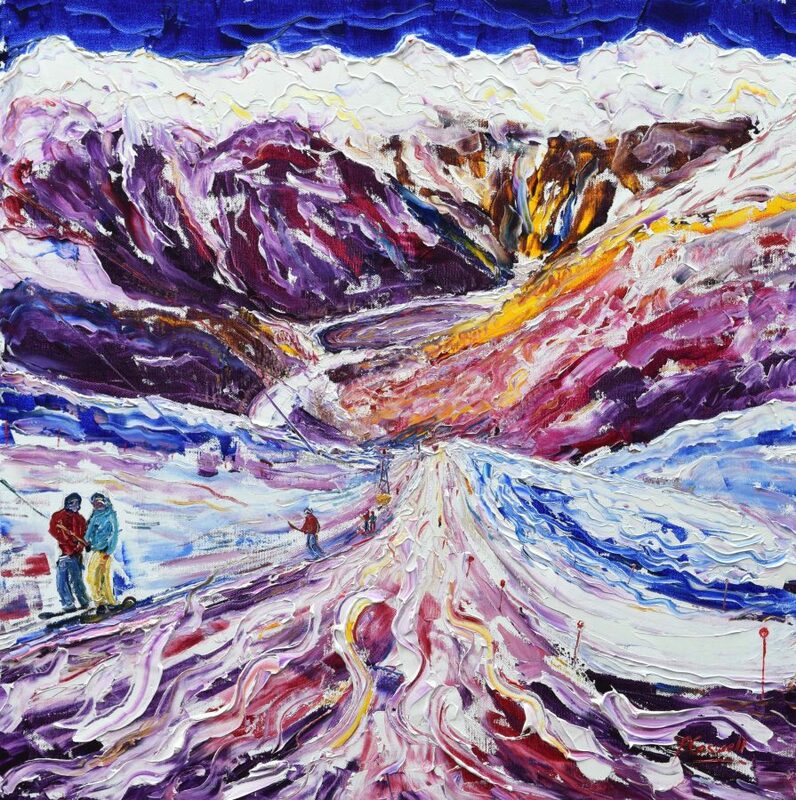 The visual clues for the paintings have been drawn from many of the scenes around the high Alps ski areas which I have adored since my early days. Having skied since I was 4 I have a great depth of memories and images to draw from. You can tell how unbelievable the whole experience was when I was young. When I returned to school after Easter break with Panda eyes, the teacher asked what I had been doing. I said I had been skiing which was promptly dismissed as a far fetched fabrication. I spend much of the winter skiing and snowboarding in the alps “working” – dare I call this work? I work / play hard collecting together all of those incredible feelings so they can be translated through the brush into some amazing paintings. I will often visit four or five of his favourite ski areas in a season so keep watching the site for new work. If you have a particular run you would like painting, give me a call and I might be able to drop it into the winter schedule or I may have already painted it. 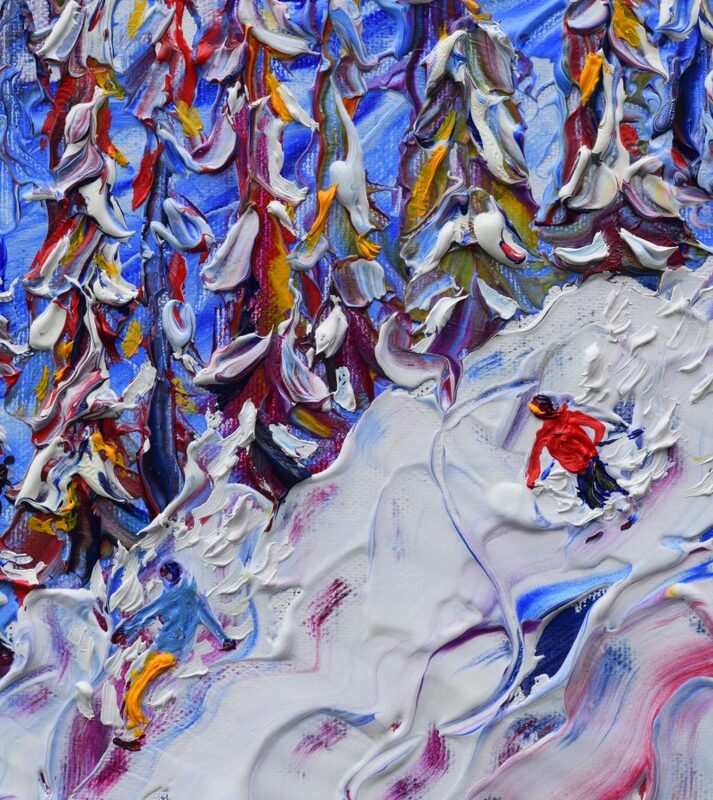 These colourful and fun skiing paintings make a great gift for any keen skier or snowboarder. Many clients have a favourite photo of them skiing in their favourite place in the Alps and often ask if it possible to commission a painting of this photo. This is something which is quite easy to arrange. Email the image to me and take a look at the paintings in the viewer of the ski paintings for sale. Your painting will be similar in style, colour, detail and general feel as some of the paintings already produced. So if you like the paintings then it is a good idea to proceed with a commission. There is a bit of freedom I need to make the painting work and I very rarely like to make faces representation as this needs quite a large canvas to be possible. Once I have seen the image I can confirm that it is possible and outline roughly how I plan to paint it, the size and the cost. The cost is usually pretty similar to those already for sale in the viewer + post and framing if necessary. Check out the Ski & Snowboard Paintings Blog to see where Pete has been visiting and painting and the video of the ski paintings below. Shop for Prints for Sale of the Skiing and Snowboarding paintings.